Excuses. 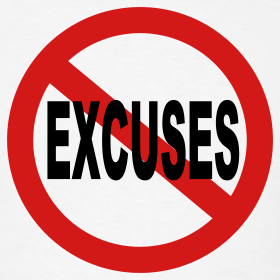 Some folks are pretty good at making excuses for their behavior. Or for failing to do something that should have been done. However, if you’re not very good at coming up with excuses, there is now a website dedicated to helping you! You can thank a fellow by the name of Ted Terrebone who has listed over 900 excuses people make for missing work, speeding, skipping school, breaking appointments, cheating on a diet, failing to pay taxes, and of course for not attending church.